U.S. stocks followed global markets further into the red on Monday as the Brexit fallout continues to ripple around the world. The Dow slumped 261 points to the lowest level in over three months. That's on top of Friday's plunge that wiped out 610 points from the index. The combined loss of nearly 900 points makes the post-Brexit turmoil the worst two-day period for U.S. stocks since the August 2015 freakout. 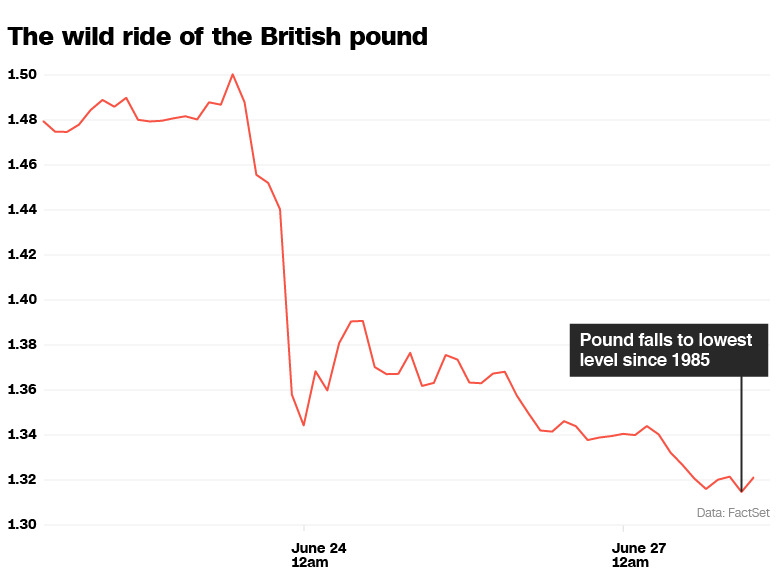 European stock markets came under heavier pressure and the pound dropped to a fresh low Monday following the U.K.'s historic vote to leave the European Union. The pound sank 3.5% against the dollar to trade below $1.32, a fresh low and its weakest level in more than three decades. Fragile market sentiment wasn't helped by Standard & Poor's two-notch downgrade of the Britain on Monday. S&P specifically cited the Brexit vote, warning it will hurt the U.K. economy, deter investment and make it harder to finance the country's large debt load. 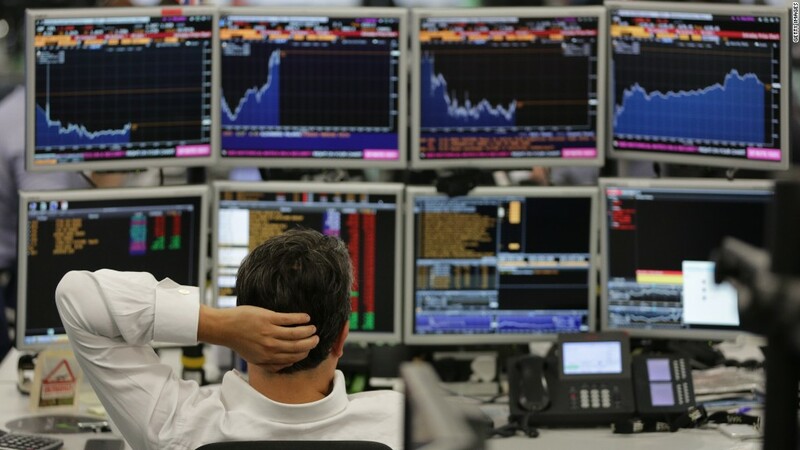 The FTSE 250, which is made up of mostly mid-sized British companies, shed 7%. Benchmark indexes in London, Paris and Frankfurt lost 2.5% to 3%. Ireland, a major trading partner of the U.K., saw its stock market plummet by 9.5%. Big banks were again targeted, and shares in Barclays (BCS) and RBS (RBS) were briefly halted in London due to extreme selling. U.S.-listed shares of Barclays are down 21% on Monday, leaving them off by more than one-third since Brexit results were announced. "The extent of the uncertainty that now clouds the U.K.'s economic and political outlook is hard to exaggerate," said Kit Juckes, strategist at Societe Generale. "Uncertainty is negative for the U.K. economy, for investor confidence and obviously, for the pound." Those question marks were highlighted by U.K. Prime Minister David Cameron, who told lawmakers on Monday that he will not trigger Article 50 at this stage. He said that move, which would officially start the exit process, will be up to his successor. The comments underscore how confusion is likely to remain for months or longer. A weak pound might help boost U.K. exports, but it can also cause prices to rise and make the country less attractive for investors. If they start pulling money out, the U.K. could have trouble funding its large current account deficit. The reaction from Asian stock markets, many of which had suffered heavy losses in the immediate aftermath of the vote, was less extreme. Most major Asian markets closed the day a bit higher, after swinging throughout the day. Japan's benchmark Nikkei gained 2.4%, clawing back some of the nearly 8% loss the index posted Friday. Still, CNNMoney's Fear& Greed Index continues to deteriorate. The gauge of market sentiment slipped further into "fear" territory on Monday after sitting comfortably in "greed" just last week. British voters chose to leave the EU in a referendum on Thursday. The U.K.'s decision to become the first country to drop out of the 28-nation bloc rattled markets worldwide on Friday. Still, the vote has far-reaching economic and political implications. Several EU leaders called on the U.K. to start the withdrawal process as soon as possible, to limit the uncertainty. But the U.K. is likely to wait before triggering the process. Prime Minister David Cameron quickly resigned, saying it would be up to the new leader to negotiate with the EU. But it will take months for the Conservative Party to elect a new leader. Meanwhile, the main opposition Labour Party also fell into chaos after the vote. Amid all that, the credit rating agency Moody's said it may cut the U.K.'s rating because of the uncertainty. One of the biggest unknowns is whether the U.K.'s vote to leave the union will trigger demands to leave from other countries, setting off a wave of turmoil. "The question has much more to do with the potential European economic shock," said Khiem Do, a fund manager at Barings Asset Management. "If Europe can find its footing and if the concern of [other] referendums in Europe will dissipate, I think European equity markets will bounce quite nicely."